Spring is here. The weather is getting warmer, flowers are blooming, and, of course, women’s tackle football season will soon commence. Obviously. The New York Sharks have been playing full-contact football for more than a decade, and they're in the midst of training camp right now. They’ll open their next Women’s Football Alliance season at the Boston Militia on April 14, with their first home game at Floyd Bennett Field in Brooklyn on May 5 against the Philadelphia Liberty Belles. It is on, as they say. 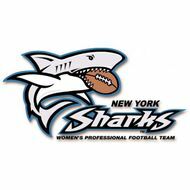 The Sharks won their inaugural game 12–6, and the next year they were invited to join the Women’s Professional Football League. In those days, the women were supposed to be paid $100 a game. Unfortunately, says Douglas, the “crooks” in charge never came through and left teams with bills instead. Today, each Shark pays about $850 per season to cover travel, equipment, and other expenses, and they play in relative anonymity — practicing two to three times a week and taking long bus trips to play opponents in Boston, D.C., Maine, and Philadelphia. Defensive end Veronica Simmons is one such girl. Before knocking women out on the field, she did so in the ring as a boxer. “I was 15–0 with eleven knockouts as an amateur,” says Simmons, who works as a corrections officer by day. “People were very afraid to fight me, all the way to the professional ranks, including Laila Ali and Jacqui Frazier. I called them out. I could never get a fight with them, because I was better.” With no more willing victims in boxing, Simmons turned her “rage” on quarterbacks. Schkeeper, an architecture grad who designs wallpaper for a living, says sometimes the bumps and bruises of football don’t translate to the social and professional worlds: “I’ve gotten some looks from people where you know what they’re thinking is that I just got beat up by my boyfriend,” she says.